I read a lot! Like a book per week. I noticed a few years back when I was unpacking my bag for a long stay of 3 weeks that an abnormal amount of space and weight of my suitcase was occupied by books. Not only that, I then started noticing how much stuff I was actually carrying with me all the time for all the traveling I did. Running shoes, walking shoes, slippers, casual shoes, sneakers. Many shirts and pants. Creams and lotions. And somehow my big suitcase was still hard to close. 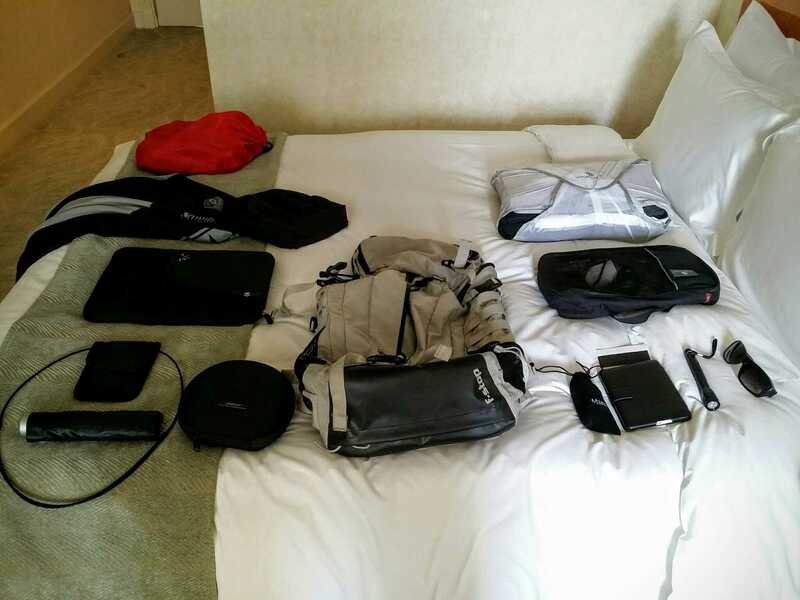 Time to start traveling light and achieve a bit more mobility; how to travel only with hand luggage? While I live in the Netherlands, I travel a lot to places where it’s either colder, but most of the time hotter then in my home country. That means that on travel day I will leave my house in different clothes that I will wear after arriving on location. I wear my jacket, or attach it on the outside of my bag. I normally wear jeans and a shirt and my running shoes while traveling. This way room in my bag is spared a lot already. Besides what I wear that day, I have my travel bag, my travel wallet and cellphone. My travel wallet differs, but mostly consist of my neck wallet (with iron secured cord) that they can’t cut and run away with. In that wallet are my passport, credit cards, loyalty cards needed for the trip and cash. My cellphone could be fitted in the travel wallet, but I prefer it in my pants as it’s a big Samsung Galaxy Note 3 phone that is not easily removed from my sidepocket. My hand luggage bag (Travelbag) is important. It needs to fit within the airline regulation for hand luggage and unfortunately this differs from airline to airline. As I most frequently travel with KLM/Air France I use their max limits (55x25x35cm), but keep in mind that especially some budget airlines have smaller dimensions. Also the max weight differs a lot. At KLM it’s 12 kilo’s but personally they never checked me in all the flight I did. However, again with the budget airlines they do frequently check the weight and I had to remove something and put it in my pockets. For this reason I travel with my perfect bag, an F-Stop Tilopa bag (it’s actually my former photography bag!) The size is a bit bigger then the max dimensions for the hand luggage, but it’s a flexible bag and I can push it in when necessary to fit the dimension checker. 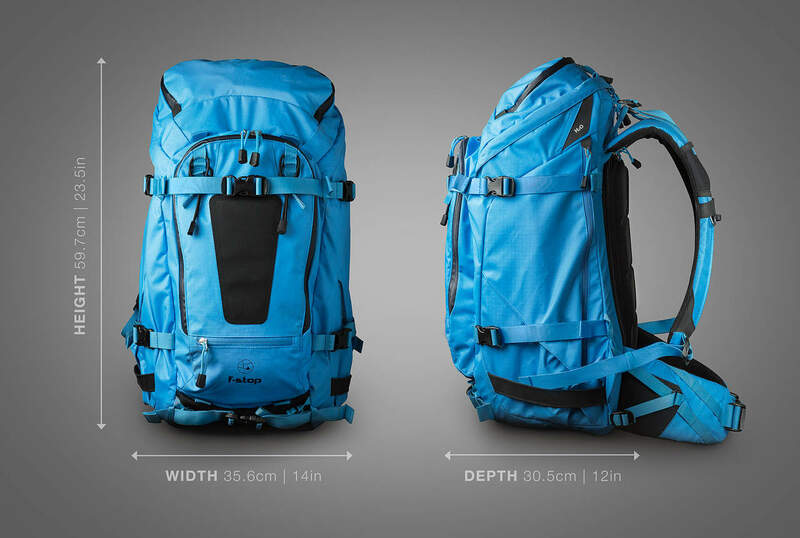 It can hold 50 liters in a dimension of 59x35x30 and I never had any problems with any airline with this bag. I like the backpack style of bags for me, it’s easy to walk around with. However lately I’ve been testing some shoulder bags as well and I’m very impressed with these. An abolute no no for me for hand luggage is bags with wheels and a handle, which you see so often. If you see how much weight and room those features take, not even speaking about the fact that I can brake… No thanks! This is one of the things that I was overpacking so much. If I go for a week or even two weeks somewhere I almost brought my whole collection of clothes, while know I just look at what I really need. I live mainly from tshirts (that I can also use for sports), a few blouses, underwear, socks, the jeans I’m already wearing, depending on temp some short (also for sports), depending on leisure or business trip certain shoes or other casual clothing. All the clothes that need to go in the bag are fold-able. 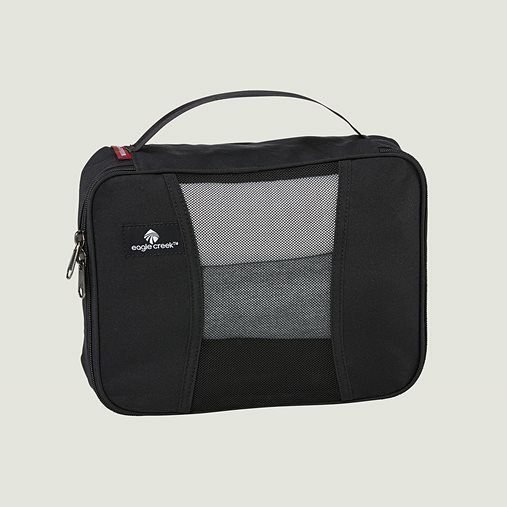 I use a packing folder from Eagle Creek to nicely make a stack of clothes and put them in the folder so they are neat and tight together in a small package. If I would need to bring an extra pair of shoes I would put them in a half-cube bag like this one, in the bottom of my bag. medicine: some aspirin and depending season my anti allergy spray. Except for the hair-trimmer, this is all put in my toilet bag which is on top of my bag and easy reachable at all times. The hair-trimmer goes in the electronics bag. Go-pro camera, extra batteries, charger, memory-card/reader, open casing, pole. All this stuff is again put in a half-sized cube like this, so that all electronics are together. In the past I used to bring an e-reader but the Google Play Books app is so good these days, with also adjusting the color of my smartphone to ideal reading condition, that I don’t need a separate e-reader anymore. All this stuff I put in the electronics bag in an envelope, except for the bank readers. When I go on a specific sports vacation like a snowboard trip, then I will add another bucket to the list where all the stuff I need for snowboarding are added to. 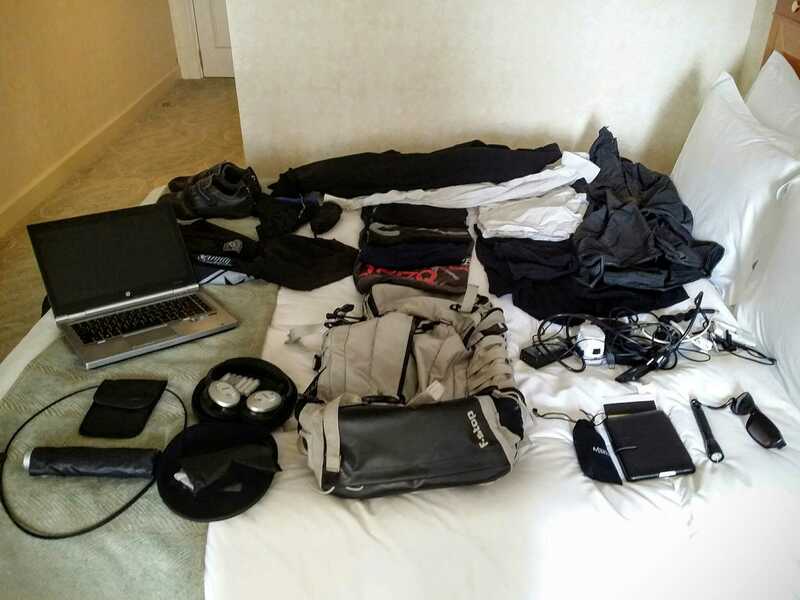 But with that amount of stuff I don’t travel with only 1 hand-luggage bag. If you are going to meet people, it’s nice to bring gifts! Especially gifts that are typical from the country you come from. While there isn’t much room, there is always room for some small gifts. Box of stroopwafels (Dutch caramel cookies), or some dutch cheese makes everybody happy. I usually use to top zipper on my bag to place such items in. In a future post I go into more detail of some of the things described here. 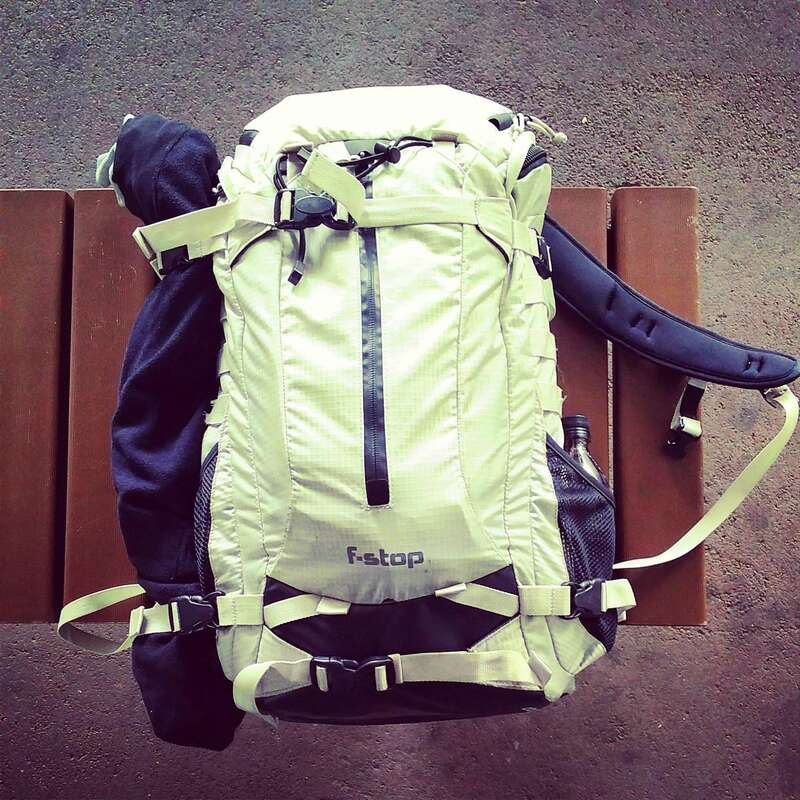 There are some specific products that you can find in travel-versions: extra small and light. For the real freak to decrease some more grams out of his bag. 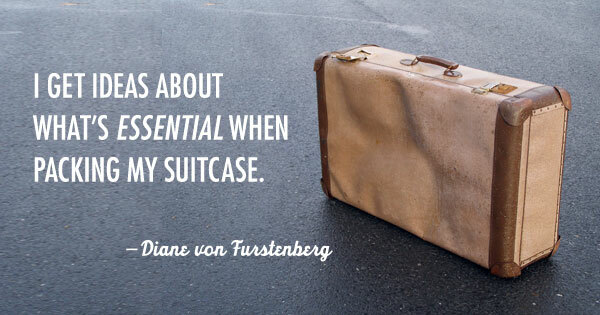 Traveling light is my chosen way!